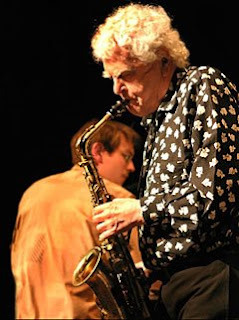 Sad news today as the German TV network DW-World announced that alto sax player Charlie Mariano died Tuesday morning at age 85 at his home in Cologne, Germany. Jazz fans will be familiar with Mariano's days with Stan Kenton or Charles Mingus but he moved to Germany in the 70s and seemed to become more adventurous as he got older. He was born Carmine Ugo Mariano Nov. 12, 1923 in Boston. His childhood hero was Lester Young. He built his reputation in the clubs of Boston during the heyday of bebop playing with musicians like Jaki Byard and Quincy Jones. He first recorded as a leader in 1950. Mariano's big break came when he joined Stan Kenton's band in 1953 and then moved to California and worked regularly with "cool jazz" pioneer Shelly Manne. He taught at Berklee for a year and then married one of his students. That would be pianist Toshiko Akiyoshi. They started touring together in 1959. He also toured with Charles Mingus and played on the classic album The Black Saint And The Sinner Lady. After divorcing Toshiko in 1967, Mariano toured the world and eventually settled in Germany. He led a fusion band in the 70s called Osmosis. He had a group called Pork Pie with guitarist Philip Catherine, he was a member of The United Jazz & Rock Ensemble and Eberhard Weber's Colors. He recorded on plenty of labels including ECM and more recently Enja Justin Time. Charlie Mariano remained young by working with younger musicians and constantly exploring different musical cultures. And he was one of the last living bebop players and he will be missed. Here's Charlie Mariano performing Drachenburg with Wolfgang Dauner and Dino Saluzzi in Germany 1989. RIP Charlie Mariano. Tara LaRosa to headline Aug. 1 WCSC show?